Speech at JNU. 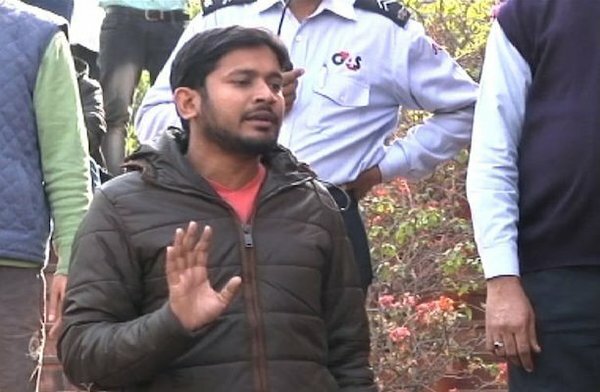 So here i am sharing all the details Related to JNU Anti National Act and what is truth behind Kanhaiya Kumar’s Arrest ,is Kanhaiya Kumar Really used anti Indian Slogans or it is a political stunt. Kanhaiya Kumar Father is a10th Drop out and his mother is a Anganbadi worker. Kanhaiya Kumar is belongs to Bihar from Begusarai District. Kanhaiya KUmar has completed his BA from MAgadh University Bihar and Now pursuing P.Hd from Jawaharlal Nehru University Delhi. He is currently the Leader of JNU Student Union. Kanhaiya’s Parents are saying that their son hadn’t done anything wrong he love his country and respect his country he can not say anything against his country. So if are searching that JNU me kya hua tha ?Than here i am going to share JNU and Kanhiaya Kumar’s All the details in Hindi also. कन्हैया कुमार बिहार के बेगुदराई जिला के एक छोटे से गाँव के रहने वाले है. कन्हैया ने मगध यूनिवर्सिटी से सानातक की डिग्री ली तत्पश्चद ओर अवी वो दिल्ली से जवाहर लाला नेहरू विश्विद्यालय से पी एच डी की डिग्री कर रहे है. कन्हैया को कथित रूप से देशद्रोही वायं देने के जुर्म मे गिरफ्तार किया गया है. परंतु उनके साथियो व परिवार जानो का कहना है की कन्हैया ने देश के खिलाफ किसी शब्द का प्रयोग नही किया था. Here i am sharing JNUSU President Kanhaiya Kumar’s Family Pics with his Father and mother. Kanhaiya Kumar Family Pics with you. Prince Kumar, Younger Brother of JNU Student Union President Kanahiya alongwith Father Jai Shankar Singh and Mother Mina Devi at his vilage Masnadpur Tola in Bihat,Begusarai on Saturday, feb 13,2016. They are in shock and anger after at arrest of Kanahaiya in recent JNU protest and clash connection.